The School Year Can Be a Pain! With the new school year in full force, it is important to know possible injuries that can occur to children who play sports such as baseball, cross country, and track. During this time of growth spurts, our muscles and bones often grow at different rates. This can cause hip pain, ankle pain, shoulder and knee pain, along with swelling and tenderness. Children have growth plates that grow new tissue at the end of the bones in our arms and legs. Bones eventually stop growing and harden when we reach skeletal maturity around ages 13-15 in girls, and 15-17 in boys. Before this happens, growth plate fractures can cause severe shoulder pain, and sometimes damage. Children who play baseball and throw too long without rest, or pitch improperly are at risk for swelling near the shoulder growth plate, which can cause it to widen not allow it to close as it should. Treated quickly, however, it can usually heal completely with rehabilitation. During growth spurts, children can develop pain in the area below the knee where the shinbone meets the kneecap. While this can happen to any child, active youth who are involved in running and jumping type sports are more at risk. Knee pain and muscle tightness along the front and back of the thigh are telling signs. If pain persists, a doctor will check for pain in the area, and watch the child walk, jump, or kneel to see if the pain is consistent. Sometimes an x-ray is ordered, but usually, rest, NSAIDS and gentle exercises are enough to help the pain and issue subside. 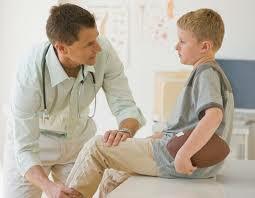 Another knee issue for active youth ages 10-15 is Sindig Larson Johansson Disease (or Syndrome). Teenagers, still in the midst of a growth spurt and are involved in sports can commonly experience this issue. Symptoms are pain at the bottom of the kneecap, swelling and tenderness, increased pain with activity, and severe pain while kneeling. Occasionally, a lump will appear at the bottom of the kneecap. As with Osgood Schlatter’s Disease, a doctor will assess the area, and may order an x-ray or MRI to diagnose the issue. RICE (rest, ice, compression, and elevation) along with NSAIDs and stretching can help ease pain. Along with shoulders and knees, foot and ankle pain can also be common in children. Sever’s Disease affects the heel of those during a growth spurt, as the heel bone often grows more rapidly than the muscles and bones in the leg. This can stretch the heel, causing pain, swelling, and tenderness. A flat, or too high arch in the foot, along with obesity, adds pressure to this area. Activities that cause pain should be stopped until the pain is gone. Warm ups and stretches are an important part of avoiding many injuries. Those in pain in the San Diego can find care at San Diego Orthopedic Surgery from our caring staff.